Ferrari 488 GTB Interior, Sat Nav, Dashboard | What Car? The interior, in contrast to the way the 488 drives, isn't quite so peerless. The function-festooned steering wheel – as with all current Ferraris – is admittedly a thing to behold, and once you’ve got used to what everything does (the indicators are buttons, for example) it’s a pleasure to use. Ditto the huge gear paddles mounted behind it. The seats, pedals and view out of the car (i.e. everything to do with the business of driving) are also beyond reproach. Many of the other items dotted around the interior, however, such as the heater controls and the right and left side screens, are a little bit too fiddly and have too many varying knobs and buttons. Some simplification is required; as is a touch more elegance – the fact that the current McLaren 650S is better trimmed and better looking ought not to be a fact lost on potential Ferrari buyers. 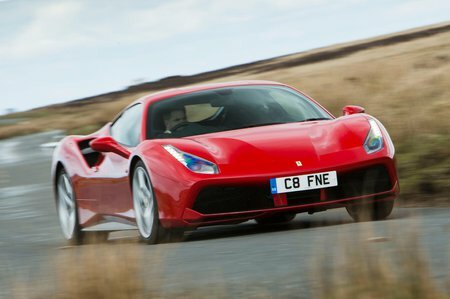 The 488's infotainment system is certainly packed with features, with sat-nav, Blutooth and even smartphone-mirroring Apple CarPlay featuring as standard. However, usability isn’t as impressive, due to the clunky interface and the relatively small display behind the steering wheel.